First off this isn't my usual cup of tea, I am not a huge fan of school comedies but I love this one! The reason I gave this series a chance in the first place is that I am a big fan of another series by the same author, Majin Tantei Nougami Neuro. (a fantastic mystery supernatural series) So I read the fist chapter and soon enough I was hooked on Ansatsu! The plot is about a trouble class at an elite school that has been selected to assassinate their teacher, who is an alien (Kinda? He looks kind of like an octopus)(Although rescent chapters suggest that may not be the case) who has announced he will destroy the world within a year and as proof he can do it he puts a big hole in the moon. As part of a deal with the Japanese government he will be the teacher of a high school class but the students are the ones who have to kill him. Sound silly? Who cares! It's a hilarious series with a healthy balance between silly gags and heart felt moments. It has everything you want and expect from a school place comedy with wonderful new takes on the genre with the addition of assassination and science fiction. 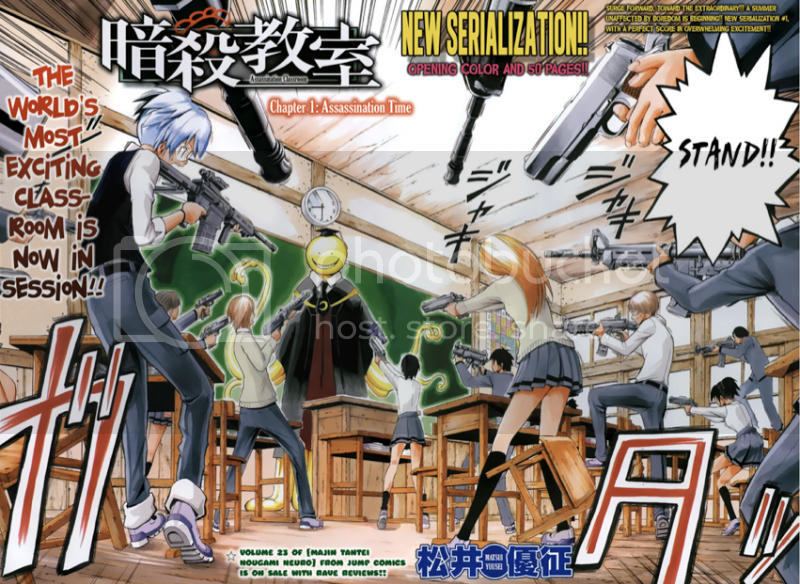 The series deals with the schools unusual politics evolving the E class that holds the students with low grades, the scifi elements with the teacher, relationships between the students to the teacher and assassination. That may sound like a lot , but for a long running series it will be perfect. Being somewhat familiar with the author I can say this series is probably in for an interesting ride and I look forward to it. Having read another series by the same author I have faith in Matsui Yuusei to develop a great story! Ps. Sorry I've been slow updating lately. I think people read these as my views have been steadily going up and I would like to thank everybody who is and has been patient with me. Also sorry its been awhile since I've done an anime, watching anime takes longer than reading a manga for me and my times been scarce .I plan to do an anime next, and as always am open to comments and requests or just chatting in general.